Jabatan Ukur dan Pemetaan Pulau Pinang (JUPEM) is The Penang State Survey Office, is the source of a collection of historic surveys, including the famous Kelly Maps. 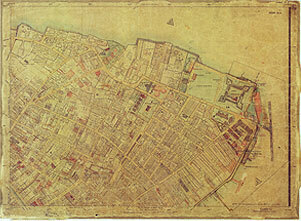 The early survey maps of George Town, Penang Island and Penang Mainland (Province Wellesley), were originally pioneered by the Surveyors Department in India, with the first Trigonometrical Surveys taking place in Balik Pulau in 1885 by Messrs Laseron & Peters, surveyors (1885-1890). Between 1891 and 1893 F W Kelly, Superintendent of Surveys took over the earlier survey work and went on to supervise the block surveys of the entire state of Penang. Kelly also updated the original 1885 Laseron and Peters' surveys. Between 1893 and 1897 Kelly's block surveys were put together in a grid forming sheets. Although not signed by Kelly these, together with the block surveys, are locally referred to as the Kelly Maps. How to request a copy without a watermark? The Kelly Maps are the property of JUPEM- Jabatan Ukur dan Pemetaan. You can contact JUPEM to find out how to purchase a non-watermarked copy. Each image has been given a scan number – e.g. K123 – please quote when ordering. 123 – refers to the number of the digitalised image – this number is different for each image. Counters are closed on Saturdays and Sundays and also on Public Holidays. To help you find the maps you want VOP is preparing pdf catalogues of all the different types of maps. These are constantly being updated as new maps are added, so please make sure you have the latest pdf, and we apologise if we are a little slow, but the catalogue needs a lot of work, mean while you can still search on the VOP site. Every effort has been made to ensure the accuracy of the information in this website. Any errors are unintentional and regretted. If you have any further information about the surveys and their content, we would like to hear from you.